Education Qualification : Passed High School/Secondary Exam From RBSE/CBSE or Equivalent Board. 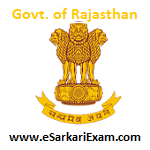 Eligible Candidates can Submit Application at the Official Website of Energy.Rajasthan.gov.in latest by 21st Sept 2018. Applicants First Logon to Energy.Rajasthan.gov.in Official Website. Open Advertisement for Recruitment of Technical Helpers II Link. Click on More Details Link. Register by Clicking on Online Registration for Helpar II Link. Pay Application Fee and Upload Scan Photo & Sign.